Have you ever wondered what REALLY makes up happiness? I think at one point or another in our lives most of us have thought about what seems to a great number of people an elusive “state of mind.” And I quote “state of mind” because we know that any given state of mind can be remarkably subjective, in light of the current flux of varying personalities and thinking modes that makes up our world today. I, too, have had my share of this long quest for happiness. At this point in my over-half-a-century life of pondering over the “happiness factor” a sudden realization strikes like a thunder of lightning sent from the sky… or shall I say from heaven instead…??? This quest has walked me through an endless search of religions, philosophies, and human thought in pursuit of this “happiness” state of mind–which can be as elusive as a butterfly enjoying the first signs of Spring! …But… Is happiness really elusive??? Well… let me tell you what I think. It is… and it is not…! No, I’m not trying to insult your intelligence or confuse you. As a matter of fact, it was many years before I came to this realization. So, what is my point? It all depends on YOU. How YOU conceptualize “happiness” is what makes it illusory or real. This is the part that makes it subjective–and NOT IMPOSSIBLE. A great number of us try brainwashing ourselves by thinking one is happy because thoughts materialize and “mind over matter” is what rules. Yes, agreed. Mind over matter is a fact. But one must also learn to know how to feed the mind with the right “food” so that “mind” can take over and rule (…”food” not limited to nutrient nourishment, by the way!). But, you may be wondering, this does not offer any clarity as to “how” I can be happy!!! Trust me… I can understand your frustration! At the risk of sounding “cliché” (is that word still used, or am I still living in the 90s???) I have to tell you that “been there done that” and “nothing comes easy”… so, tell me something new, you might be thinking. I’ll try to make a little more sense of this. What is happiness for me? How can I experience that state of mind? Notice that I emphasize the word “experience.” That is because we are all here, united on this plane, universe, or dimension (whatever you prefer to call it) to experience life equilibrium. Yes… it’s all about balance! Yes… balance in everything we do. Have you heard the saying “too much of a good thing is bad for you?” I would add “too little of a bad thing is bad for you!” This sounds somewhat dubious but when we consider that we are human and therefore not perfect, we can see that there will always be a desire for things that we know in our heart are not right to think, say, or do… but we still do because it is in our nature; it is part of life. Not to mention that what is “bad” for you may not necessarily be “bad” for me. 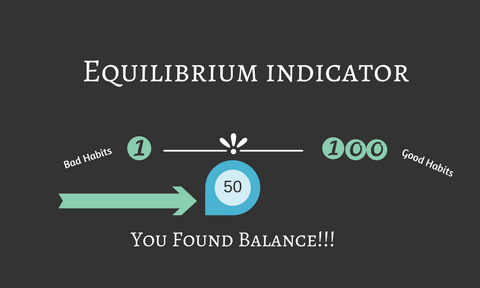 Think of it as an “equilibrium indicator.” Visualize a horizontal line numbered left to right, from 1 to 100. Happiness for me is being as close to the 50 mark as possible because 50, the middle of the scale, is the ideal equilibrium. And this is the ray of light which opened my eyes to the realization that I can stop searching for answers to things such as the meaning of life, or the meaning of happiness, or the meaning of….. and instead just start living!!! One can easily become frustrated and very lost in the sea of “why.” This concept came to me when I most needed it, thanks to someone whose thinking reaches far out more than most of us because it is beyond the reach of our five senses. I will be telling you more about this later on, so stay with me and my upcoming blogs because part of my happiness mix is YOU. Yes… I enjoy “listening” to your thoughts. I know that there is way more to life than meets the eye (am I sounding cliché again???). And this “knowing,” without any doubt, is part of the food I feed my mind so it can rule matter and make me happy. And so I learned to find in each and every circumstance an experience urging me toward the 50 mark–ideal balance. For years I’ve wanted to share this with many people–not just the ones in my immediate circle of family and friends. This is my pay it forward for the peace of mind and “subjective” happiness I have today. And that makes me very subjectively happy! So… what makes you happy? If you don’t have an answer yet, let’s try to figure it out together!